The hype for Avengers: Endgame has reached a fever pitch, with the release being only a month away. Theories abound, and rare leaks keep giving us more information about the movie. One of the most interesting was about the toyline. Not only do the Avengers all seem to have an attractive new uniform, but the Hulk’s figure was the most interesting. The Hulk isn't typically one for wearing uniforms, and the lack of rage on the Hulk’s toy implies that there’s a good reason why Hulk is absent from all the hype materials. It all began back in 1962, with Marvel’s second issue of the Hulk. Hulk was initially planned to be gray, to look monstrous and inhuman just from his coloring alone. However, according to Stan Lee and Jack Kirby, the colors just weren’t consistent in the printing, and gray proved to be incredibly expensive for a small company. So, with the next issue, Hulk became his jade self. 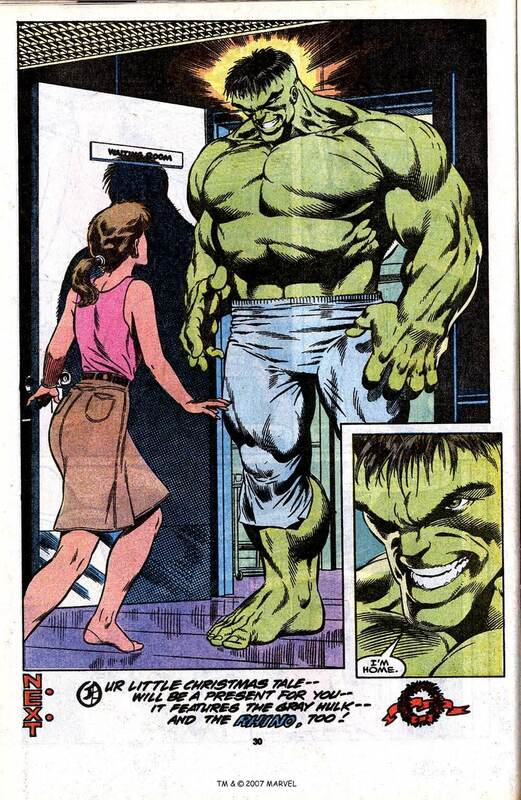 Not much was made of this in the fandom, and a lot of people blamed it on the classic weirdness of the old Hulk books. After all, the first books featured things like the Hulk only changing at night, and then just transforming when Banner was dosed with a gamma ray machine. That machine would have some severe issues. However, this would change with a simple writer change. Al Milgrom had come up with a few ideas to twist on the story of the Hulk. In an incident, Bruce was cured of the Hulk while his friend and sidekick Rick Jones instead became his gamma-powered Hulk. Bruce was also a member of the Gamma Base, a group intended to take out the Hulk with fantastic technology. Issue 331 became the first issue of Peter David’s massive Incredible Hulk run, one that would last for almost a decade. The end of the first issue had Bruce take on his old Gamma powered machine mentioned above to become a Hulk again, removing the green from Rick Jones. However, what would happen in the process is that the green Hulk would show a return to that gray from the first issue way back in 1962. Gamma Base would become a footnote, as this new Hulk would prove to be a more savage incarnation. More intelligent and brutish than the gentle green giant, this Hulk wasn’t against fighting dirty. This personality helped make up for his weaker nature, dependant on the phases of the moon and the night. After several battles with one-off villains, both new and old, the old Hulk enemy the Leader would trap Hulk with a gamma bomb. The world believed the Hulk and Bruce Banner to be dead, but that wasn’t entirely the case. The place is Las Vegas. Hulk, having landed in the middle of the City of Sin and Vice, has decided to take a new name: Joe Fixit. Hired on as a Casino bouncer, this incarnation of the Hulk would work the nights and become Bruce once more during the day. These issues were filled full of humor, action, and some of the best early art from Todd McFarlane. However, while Peter David’s run wouldn’t come to an end, Fixit’s would. Confronted with an extreme amount of stress, the Green Hulk would eventually return. This change of Hulk would cause the Hulk’s mental state to be shaken up drastically. It would be hard to tell which Hulk would come out next, and the green one would be more unstable each time. The art team would have a field day with this, actually, with some of the most disturbing G-rated imagery possible. Finally, gamma-powered psychologist Doc Samson would sit down with Bruce Banner in issue 377 and use hypnotic suggestion to work on the problems of each Hulk together. Peter David would work on the past of Banner, revealing his father to have been abusive to Bruce when he was younger. The bottled up rage would become the Hulk, and coming to terms with that would result in a new version of the Hulk. This Hulk is easily the smartest so far, with the brains of Bruce Banner in the body of a Hulk while still keeping the savage cunning of Joe Fixit. Still stronger than most heroes, this Hulk would crack wise and fight for what’s right rather than what’s just messing with him at the moment. ...or teaming up with Venom to take down a random villain named Doctor Bad Vibes. It was the 90s. Things were weird. Professor Hulk would come up against a foe he couldn’t beat on his own, however. The same as almost every other major Marvel hero in 1996: Onslaught. Unable to pound down on the most massive foe of the 90s, he would ask for his mind to be turned off. With that, the Professor Hulk would be relegated to the back-issues of history. While Hulk has had many changes since none of them have quite been like the Professor Hulk. Now, is this what we’re going to see in Avengers: Endgame? Possibly. Marvel didn’t have a problem showing off the Hulk in promotional materials for Infinity War, and it wound up being a twist for the Hulk and Banner disagreeing. Action figures are far from a critical indicator as to what’s going to happen in a movie. Otherwise, Batman Returns would have been one hell of a weirder movie. On the other hand, Marvel has yet to lie about things with their action figures. I’d put odds at about 50/50 at this point, with my money on Professor Hulk happening during the movie. Still, even if it doesn’t happen, the film has certainly set up a return for some form of the Hulk thanks to his arguments with Banner. We’ll have to wait and see if the action figures hold, or if they’ll wind up being visual representations of an old version of the script.